The legislature amended Taiwan's animal protection law to double the maximum penalty for deliberate harm to animals. Beijing: Taiwan's legislature has explicitly banned the sale and consumption of dog and cat meat and increased the penalty for animal cruelty, underscoring growing awareness of animal welfare in one of Asia's most prosperous societies. The legislature amended Taiwan's animal protection law to double the maximum penalty for deliberate harm to animals to two years in prison and a fine of 2 million Taiwan dollars ($65,000). People who sell or eat dog or cat meat face a fine of up to 250,000 Taiwan dollars ($8,000) and their names and photos may be publicized. Drivers and motorcyclists who pull animals along on a leash also face a fine of up to 15,000 Taiwan dollars ($500), according to the amendments passed Tuesday. While consumption of dogs and cats was never widespread in Taiwan, the amendments point to increasing concern for the treatment of animals on the island, where many residents lavish money and attention on their pets amid a plunging birthrate. Two decades after Taiwan began grappling with the abandonment of pets and other problems, the island has some of the most comprehensive protections on the books anywhere in Asia. 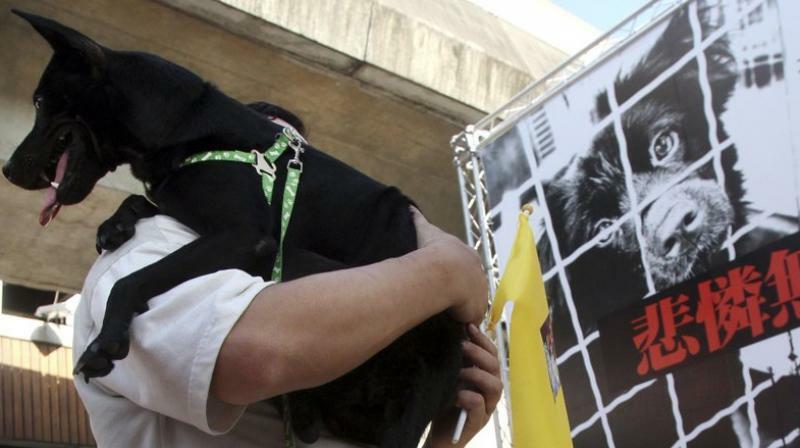 President Tsai Ing-wen's team portrayed her as an animal lover during her election campaign, focusing on her two cats. She later adopted three dogs.